If you have access to iPlayer, the Beeb have made a classic piece of sci-fi available. The classic sci-fi serial. Namely, Nigel Kneale’s third 1958 adventure with the chap from the British Rocket Group, Bernard Quatermass. 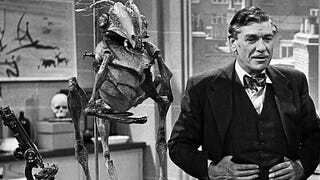 All six episodes of Quatermass and The Pit directed by Rudolph Cartier and staring Andre Morell are online for 11 months.